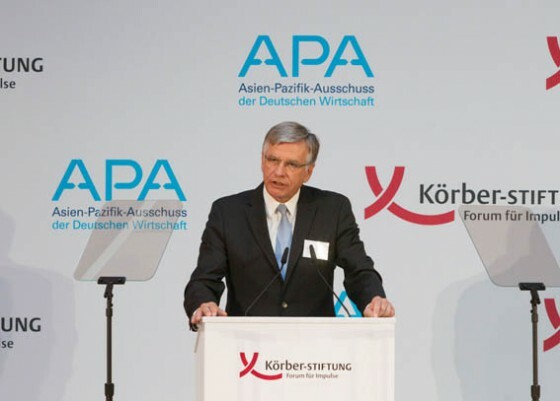 The 16th Asia-Pacific Conference of German Business (APK) has taken place from 1 to 3 November 2018 in Jakarta, Indonesia. The conference was co-chaired by APA-Chairman Dr. Hubert Lienhard and the Federal Minister for Economic Affairs and Energy began with a welcome reception on the evening of 1 November 2018. EKONID/AHK was the local host and the organiser of this event. For general information about the APK pleace visit the APK website. 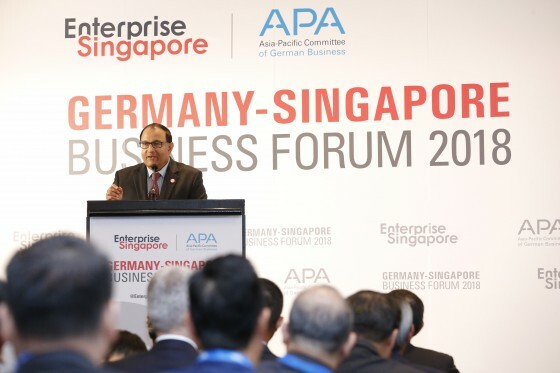 On April 24 2018 the Asia-Pacific Committee of German Business (APA) together with Enterprise Singapore (ESG) held the 13th Germany-Singapore Business Forum (GSBF) at the side-lines of the Hannover Messe. The aim of the GSBF is to promote economic relations between the two countries with a special focus on SMEs. The GSBF began with greeting remarks from the two co-chairmen, Mr Philip Yeo and Prof. Axel Stepken. Guest of honour was Mr. S. Iswaran, Singapore's Minister of Trade and Industry, who gave the keynote speech and highlighted the potential for even closer technology partnerships. This was followed by two panel discussions that highlighted cooperation between German and Singaporean companies in the development of the ASEAN markets and "co-innovation" that is the joint development of new products and technologies. The Indo-German Business Summit 2017 has been jointly organized by the Asia-Pacific Committee of German Business (APA), the Confederation of Indian Industry (CII) and the Federation of Indian Chambers of Commerce and Industry (FICCI). Federal Chancellor Angela Merkel and Prime Minister Narendra Modi opened the summit with their statements. Both agreed that the bilateral economic cooperation is below its potential and should be extended. Subsequently a high-ranking CEO panel discussed about actual opportunities, which sectors offer these and which framework conditions are necessary for further bilateral engagement. The 15th Asia-Pacific Conference of German Business (APK) took place in Hong Kong from 3rd to 5th November 2016 in Hong Kong. The conference was co-chaired by the Federal Minister for Economic Affairs and Energy Sigmar Gabriel and APA-Chairman Hubert Lienhard. In 2016 more than 1000 participants took part in the conference making it the biggest Asia-Pacific Conference of German Business of all times. The central topic of the conference was how business and politics from the Asia-Pacific and Germany can work together to encounter the momentum against free trade and open borders, a trend that is increasing globally. Frequently, the discussions centred on the question how the benefits of free markets can be communicated in a better way in order to win back the society’s acceptance of free markets. In addition, topics such as innovation, Industrie 4.0, environment technologies or sustainable urban planning were on the conference agenda. 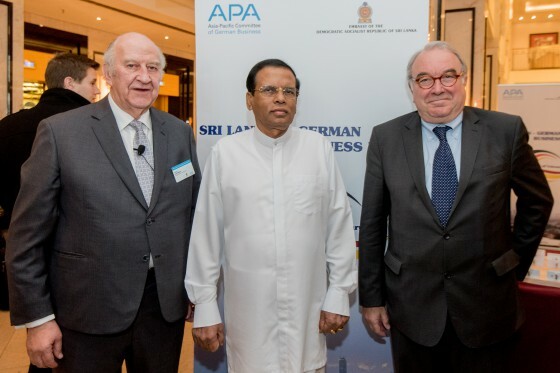 The Sri Lankan-German Business Forum has been jointly organized by the Asia-Pacific-Committee of German Business (APA) and the Embassy of Sri Lanka in Berlin. The Forum was opened by the President of the Democratic Socialist Republic of Sri Lanka, Maithripala Sirisena, Uwe Beckmeyer, Parliamentary State Secretary at the Federal Ministry for Economic Affairs and Energy and Edgar E. Nordmann, Chairman of the Managing Board of Georg Nordmann Holding AG and Founding Chairperson of APA. The subsequent panel discussion highlighted reform approaches of the new Sri Lankan government and resulting business opportunities. Approximately 300 participants attended the event. On the occasion of the journey of Federal Chancellor Merkel to China, the second meeting of the Chinese-German Economic Advisory Committee (DCBWA) took place in Hefei, province Anhui, on 30 October 2015. Federal Chancellor Merkel and Prime Minister Li Keqiang attended this meeting. 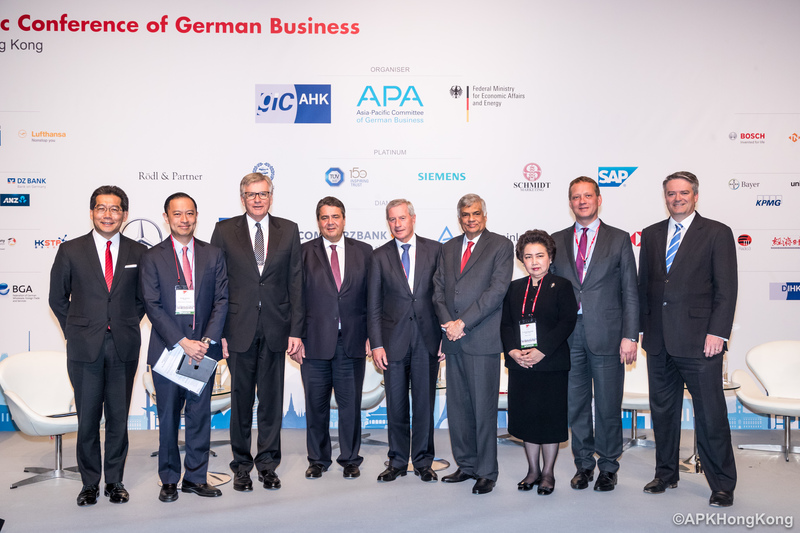 The Indo-German Business Summit was organised jointly by the Asia-Pacific Committee of German Business (APA), the Confederation of Indian Industry (CII) and the Hannover Messe. 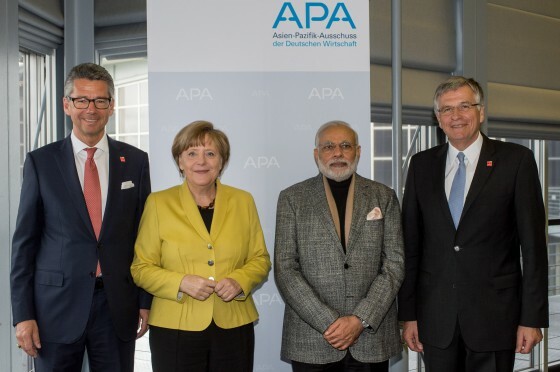 It was opened by Chancellor Angela Merkel, Prime Minister Narendra Modi and APA Chairman, Hubert Lienhard. As co-initiator of the „Make in India“ campaign, Amitabh Kant (DIPP) subsequently introduced the panel discussion on the subject „Make in India – Expectations of Business“ with an input statement. Joe Kaeser (Siemens AG), Baba Kalyani (Bharat Forge Ltd.), Cyrus Mistry (Tata Sons) and Klaus Rosenfeld (Schaeffler AG) took part in the panel discussion. Approximately 800 business representatives from Germany and India attended the summit. 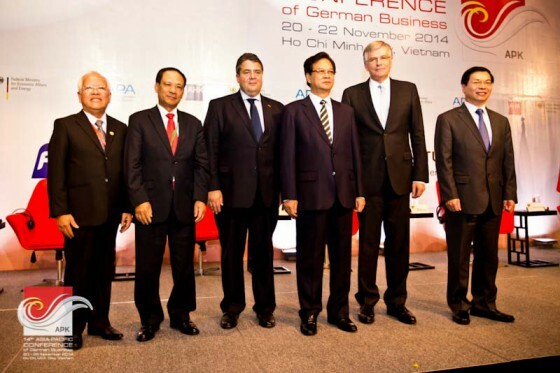 The 14th Asia-Pacific Conference of German Business took place from 20 to 22 November 2014 in Ho Chi Minh City in Vietnam. As one of Germany’s most important business partners in South East Asia, Vietnam hosted this event for the very first time. With more than 800 participants from 31 countries the conference was very well attended. For further information, e. g. speeches and photos, please click here.